There’s a new battle brewing between the giants, and it’s happening in your garage and on the road. Who’s winning? The smartphone wars have been fought and won (well, at least for now), but now there’s a new electronics battle brewing in your garage, rather than your pocket. The talk of smartphone SoC technology proliferating from phones and into cars has finally transformed into action, and major electronics companies are striking deals with established automobile manufacturers to integrate the benefits of a smartphone’s communications, multimedia and data processing abilities into your car. There are two divergent models of how this will occur, integrated vs. bring-your-own-device (BYOD). And there are two new competitors in BYOD, Apple CarPlay and Google Android Auto. Some electronics history: Contrary to what many people think regarding Microsoft’s and the U.S. auto industry’s capabilities for innovation, SYNC pioneered integrated in-vehicle communications and entertainment using “consumer-like” technology back in 2007. This was uncharted territory for the automobile industry, bringing communications, mapping and media capabilities from the established home-use user model to the automobile. 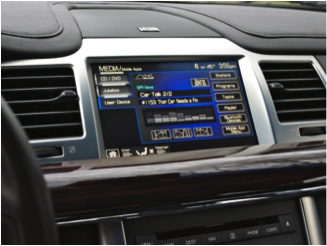 Although the SYNC system communicates with a mobile phone through Bluetooth, at its core it is an integrated embedded system, with a head unit that includes the Audio Control Module (ACM) and a separate module called the Accessory Protocol Interface Module (APIM). Both communicate using a vehicle’s existing CAN buses. The system runs Windows Embedded on Freescale’s ARM 11-based i.MX31L processor. As SYNC evolved into a compelling feature, other automobile manufacturers chose to offer integrated infotainment and navigation systems using their own user interfaces rather than Microsoft’s or another vendor’s. Toyota’s Entune was released in 2011 and HondaLink followed last year. Deeply embedded systems like Ford SYNC, Toyota Entune and HondaLink make the assumption that the primary “brains” of the system, meaning the media content and processing power, should be built into the car itself. However, as smartphones have proliferated and increased in processing power and storage capability, a new use model is emerging where the brains remain in the phone, and the automotive electronics become a “peripheral” used primarily for the human-machine interface. We are seeing this today with the introduction of Apple CarPlay and Google Android Auto, where apps on your phone will be controlled via touchscreens, hard buttons and voice recognition integrated into the auto’s electronics. Drivers and passengers can continue to have a single place for most of their mobile content and contacts. No need to sync or download content to a separate system in a car. Automobile manufacturers can get the latest technology into cars sooner. This benefit is a little subtle. For electronics that are embedded into a car, there is a much longer integration cycle than there is for consumer electronics that wirelessly link to the car. There are two main reasons for this. First, the development cycle and product life for a car is measured in years while for a phone it is measured in months. Second, there are functional safety requirements specified by the International Organization for Standardization (ISO 26262) that require safety-specific documentation for electronics that are embedded in the car. Creating the documentation and doing additional testing can add 20% or more to the cost of semiconductors and systems embedded in automobile. Because of the business issues and time cycles involved with traditional embedded automotive electronics, the BYOD model will most likely predominate. It gives the consumer access to their current technology in their car while avoiding the increased development costs of traditional automotive electronics. Apple CarPlay vs. Google Android Auto: A tie for now? Apple seems to have a head start. Apple has announced that five automobile makes will release CarPlay models in 2014. Google has none announced for 2014. But Apple and Google Android are poised to be even next year. Apple has announced 28 total makes that will use CarPlay. Google Android Auto has 26. The auto manufacturers are hedging their bets! 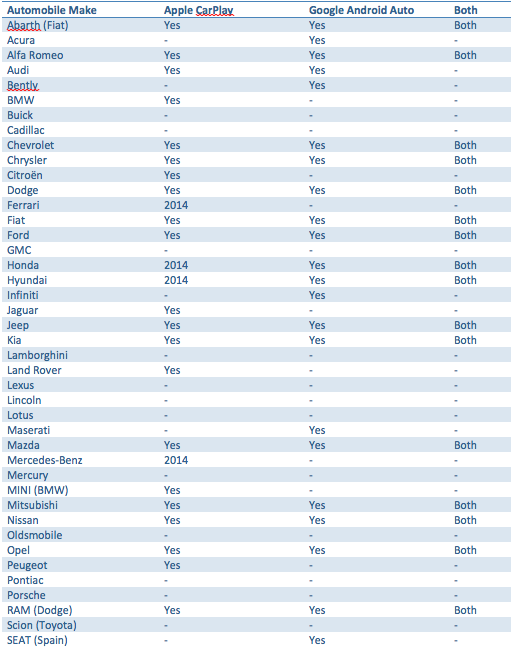 18 of these 28 and 26 makes are doing both Apple CarPlay and Google Android Auto.